The first Medical College was begun in 1929 at Bangalore. The Medical College was shifted to Mysore in 1930. 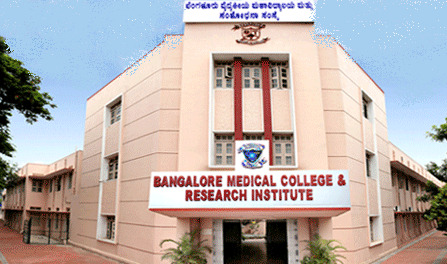 The Bangalore Medical College was formed in 1954. Later, the Kasturba Medical College at Manipal and the Karnataka Medical College at Hubli were started in 1953 and 1956 respectively. In 1993-94 Karnataka had 19 Medical Colleges, 41 Dental Colleges, 61 Pharmacy colleges, 11 Nursing Colleges, 16 colleges of Ayurvedic medicine, 3 Homeopathic Colleges. The only Unani College of Medicine(1975) is located at Bangalore and offers B.U.M.S Degree of 5.5 years. In 2013 Karnataka had 42 medical colleges – 12 Government, 11 private minority, 13 private non-minority, 6 deemed. In 2013 Karnataka had 38 dental colleges – 2 Government, 13 private minority, 13 private non-minority, 6 deemed. Government of Karnataka, Department of Technical and Medical Education, conducts Common Entrance Test for admission to first year M.B.S/B.D.S/B.Tech/B.Arch. courses in various universities in Karnataka. Equal weightage is given to marks secured in qualifying exam and the Common Entrance Test. All candidates desirous of joining professional courses must compulsorily appear for Common Entrance Test conducted by the Government of Karnataka both for “Free seats” and “Payment seats”. Following table shows the number of seats that were available in Karnataka medical colleges in 2013. Following table shows the number of seats that were available in Karnataka dental colleges in 2013. A person who has passed the second year Pre-University or XII standard or equivalent examination in the year of admission or earlier (qualifying examination) with Physics, Chemistry and Mathematics in respect of Engineering courses and Physics , Chemistry and Biology in respect of Medical and Dental courses as optional subjects and English as one of the languages and has obtained not less than fifty percent, of the aggregate marks or equivalent grade in the optional subjects is eligible for admission. In case of candidates belonging to scheduled caste and scheduled tribes and category-I the minimum marks for the purpose of eligibility shall be forty per cent of the aggregate in the optional subjects. Further, the person seeking admission to Medical and Dental courses should have completed the age of seventeen Years as on 31st December to the year of Admission. Karnataka has about 61 pharmacy colleges that offer Diploma in Pharmacy(D.Pharm), Bachelor of Pharmacy(B.Pharm), Master of Pharmacy (M.Pharm). Al-Ameen College of Pharmacy was founded in 1982. Krupanidhi College of Nursing, Bangalore. Started in 1992, offers Diploma in General Nursing & Midwifery.